New acquisitions by Colin McCahon, on show in Toi Te Papa. The other night we hung the two McCahons we bought last year – Scared and Mondrian’s last chrysanthemum. They’ve gone up in Toi Te Papa. In the mid-1970s Colin McCahon did a lot of paintings on a thick high quality paper called Steinbach. Legend has it that McCahon’s dealer Peter McLeavey bought 100 expensive sheets of Steinbach paper from Webster’s Art Supplies in Wellington, of which McCahon received the bulk (Allen Maddox got a smaller share). McCahon couldn’t get enough of the stuff, and series followed upon amazing series. He painted three sets of Teaching aids, two each of Noughts and crosses and Rocks in the sky, a set of Clouds, and many others besides. This was an artist working at the height of his powers, producing works that were urgent and direct, but also subtle and supremely elegant. 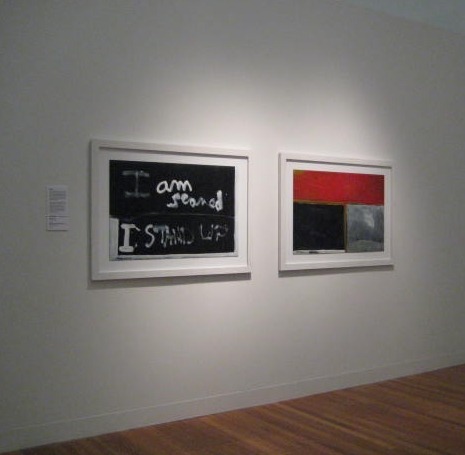 A few years earlier, McCahon had written, ‘I’m finished with frames and all that they imply. I want paintings to pin up or nail up or tie up with string. I think it gives them more freedom to act.’ That was precisely what he did with these works when they were first exhibited. Indeed, you can still see the pin holes in the corners. Showing the paintings safely and ensuring their longevity makes it difficult to honour those intentions. Frames are always a kind of imposition on these works, but a necessary one. Added to this is the issue that a previous owner of Mondrian’s last chrysanthemum stuck it down on hardboard (a common fate for many such works). I really like the solution our framer came up with for Scared and Mondrian’s last chrysanthemum. No stranger to McCahon’s works and the issues of their display, he made frames that were as simple and as neutral as possible. The frames sigh quietly back into the wall, leaving the paintings free to act. The performance is stunning. I am the framer maker behind this resolution, with much input from William and the paintings conservators. Thanks for your comment, Ron. Congratulations to Te Papa for acquiring two outstanding late works by Colin McCahon. I saw these paintings when they were first shown publicly and I thought that they were a knockout then, since then they have gained in emotional wallop. I like the sympathetic framing also; it is a subtle way of indicating that they were both first pinned to the gallery wall. Yes, they will be on show for a while yet. I’ll be doing a floortalk on them as part of Art after dark on July 16. Keep an eye out for details. Oooh I’d love to see them. Will they be up for a while?